When we arrived in Costa Rica a few days ago, our first stop, fresh off the plane, was the grocery store in town because it’s a 30-minute ride over rutted, unpaved roads to get to Casa Muy Grande, our house by the sea. We just can’t make an easy grocery run every day, so we tried to stock up. But we had no plan. We kinda grabbed stuff willy-nilly: avocados, cucumbers, oranges, onions, chicken breasts, ground beef, eggs, bacon, limes, beer and liquor (living with non-paleos this week), and plantains. (And I bought a little packet of cumin, just in case.) With no firm menu, we kinda thought with these base ingredients, we’d figure some stuff out. This morning, I decided plantains would make an excellent side for scrambled eggs, but I was too lazy to look up a recipe. I just kinda winged it, and it worked out great. So here’s my non-recipe for platanos maduros, Casa Muy Grande-style. Peel the plantains. The easiest way is to cut off both ends, then make shallow slits along the ridges in the skin that run the length of the plantain. Use your fingers to pry off the strips of skin. (Here’s a very detailed video. Good golly! It’s not brain surgery.) 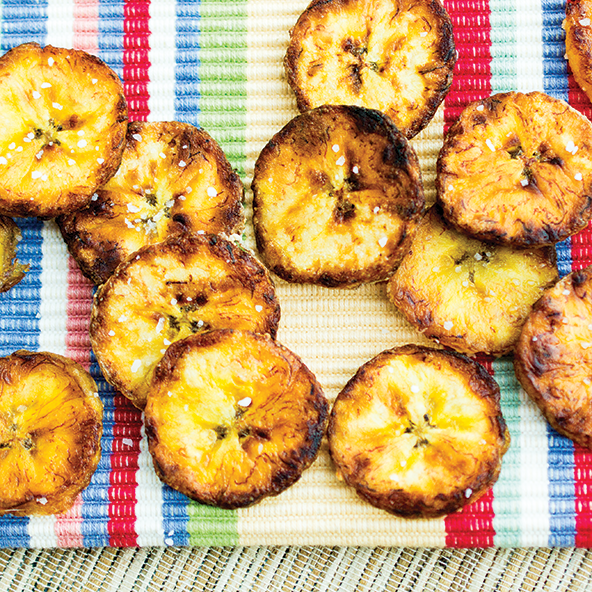 Slice the plantains into 1/4-inch thick coins. Heat a large, non-stick skillet over medium-high heat, about 3 minutes. Add coconut oil and allow it to melt. Add the plantain slices in a single layer and allow to brown on the bottom, 2-3 minutes. Flip and brown the other side. Keep a close eye on them; the sugars in the plantains can turn from brown to black in a blink. When you’re happy with the color, sprinkle generously with salt and a bit of cumin. Remove to a serving plate and squeeze fresh lime juice over the top. Eat immediately. Fork optional. water, sugar, iodized salt, vegetable concentrate, molasses, spices (with mustard and celery), modified corn starch (thickener), acetic acid (acidulant), Potassium Chloride, chile pepper, hydrolyzed vegetable protein, sodium benzoate (0.09%) as preservative. Treated with ionizing energy. Despair! But then: Joy! Because I figured out a homemade, paleo, Whole30 compliant version. LIZARD SAUCE! Can you use coconut oil instead of cooking fat? Oh! Definitely. I’ll change that so it’s more clear. Awesome! Thanks, I can’t wait to try it! I am a Costa Rican so I know about plantains (Platanos) both ripe and green. We slice the ripe ones without the water and they come out delish. With the green ones, once again they are sliced about an inch thick, fried, smash down and refried again, sprinkle with salt, add lime juice if desired. Yum! The plantains look beautiful! I always forget to buy them at the market because they are so green (and I’m sort of an impatient chef). Wow, those turned out beautifully! I bought a huge bottle of that kind of salsa when we were there but have not tried it, in fact kind of forgot about it. I will have to give it whirl this week. I loved the plaintains when we were there, had them salsa and guac for afternoon snacks. Oh man, now I want Lizano. I have not found many good sources to buy it in the US, so if you like it, buy some to bring back, even with the marginal ingredients! Sounds like you’re having a delicious time by the sea! Plantains are a favorite of mine also, but I haven’t had them with cumin – I’ll have to give it a try. Enjoy the rest of your trip! Love the plantains! Really just discovered them as a good carb source to fuel my workouts. I cut them in chunks, fry both cut sides in coconut oil till browned, smash them between two cutting boards, refry till crisp and sprinkle with sea salt. The sweet/salty thing is great and I could see them being a good sub for pancakes, maybe with bacon or sausage for breakfast. I’ve been Whole 30-ing and noticed that my legs didn’t have the zip I needed to power through sprints. A few pieces of plantain the night before fixed it! Gonna try it with cumin next. 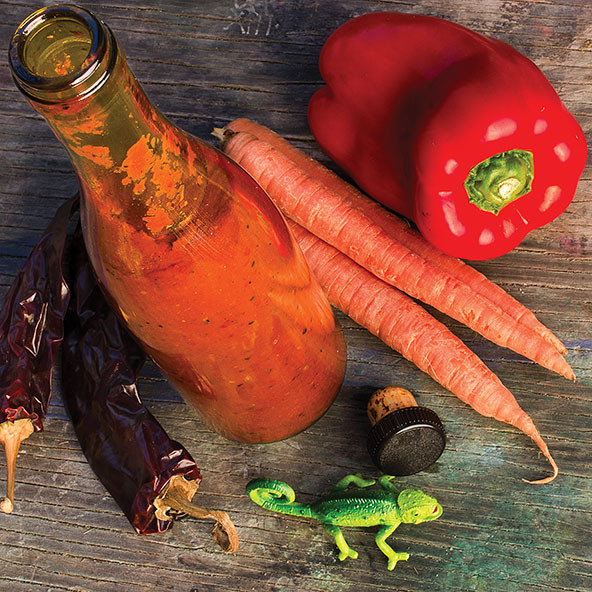 While you’re there, see if you can find Maya-Ik hot sauce. It’s got a smidge of sugar in it, but only a smidge, and it’s the best darn hot sauce in the world. It’s a Guatemalan product, but it’s honestly worth a side trip to Guatemala to get it. I came back from my vacation with 22 bottles. Not kidding. Twenty-two. And when I run out, I’m going back to Central America. Hi Mel! Just found your blog and even though we don’t eat a paleo diet (to be honest I’m not even really sure what that means….hahaha) I’m always looking for new recipes and wanting to try new things. Forgive my ignorance but what color are plantains when they’re dark….black? Also, I’d love to see a print button under your recipes so that I can print just the recipe without everything else that’s on the page. 🙂 I’m looking forward to trying many of your recipes!! Welcome! I’m glad you found me. Hope you have lots of fun trying out the recipes. You don’t have to be paleo to enjoy delicious, real food. YAY! LOVE your book and your recipes. Can’t wait to try this! We have a fruit and veggie co-op called bountiful baskets and we got some plantains this week and I had no idea what the hell to do with them! Now I do! You are awesome- thanks for the fun recipes! Lucky you, getting plantains in your basket. Hope you like these! Salsa Lizano really is great! My mother (native Costa Rican) used to make lamb chops with it. Also good with arroz con pollo. Anyway, the ingredients used to look much better until it was bought by an American company. Go figure! I’ve looked around and there are different formulations, some which almost approach Paleo friendly. I haven’t kept track but search around and let us know if you find a better source. I’ll probably be down there next winter and will see if the local stuff looks better or if I can stop by the factory to ask about it. Oh, man! I just want to put that stuff on everything. And it is REALLY sad that the recipe was cleaner before the American company took over. Not surprised, though. BOO! Definitely let me know if you find a clean version — and you know I will share the info immediately if I find it. YUM. Thank you for yet another great recipe Mel. When I’ve fried plantains in the past, I’ve 1) used too much oil and they’ve been too rich, and 2) not liked the messy smasing so much. Steaming, then using less oil works better for my taste! 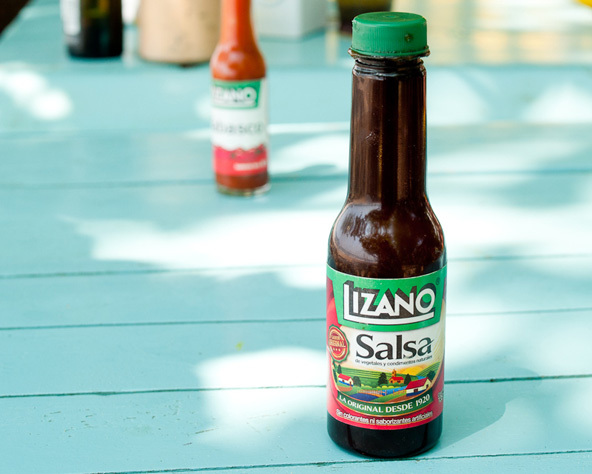 I’m a little late to this party so you may have already found this or something better, but I found websites for buying Lizano in the US, a recipe for making your own Lizano style salsa, and also a site that sells the Guatemalan Maya Ik hot sauce. You are AWESOME for sharing that link to the recipe. Can’t wait to try to paleoize it. WOOT! Hey Melisa, I’ve just discovered your website and I love it. I’m not sure I’ve understood about Lizano sauce, is this accepted in paleo diet and it the whole30 diet? Sorry, no. The Lizano Sauce is not paleo nor Whole30 approved. BUT… I have a Whole30 approved recipe for my homemade version in my cookbook Well Fed 2 (http://amzn.to/GZDvq6). It’s REALLY good and doesn’t include the sugar and mystery ingredients of the commercial version. So easy and good! I served it with the crazy good bbq pulled pork and a ton of lime, yum! I made these today with coconut oil, sprinkled with salt, cumin and lime juice. I’m glad I used only one plantain because I ate all the chips and was full. They were delicous… I can’t decide what the taste was… something familiar but I can’t quite decide. Maybe a potato chip or a jojo? Anyways, they were yummy! Thank you and I am enjoying your Well Fed cookbooks! I’m so glad you liked them! They do have their own taste, don’t they? Kind of a potato chip, but not quite. Happy cooking! Yum! Those were delicious! Thank you!!! These are delicious! Can I save in them in an airtight container on the counter? In my opinion, the texture doesn’t hold up that well for very long — and I’d recommend storing them in the fridge, then reheating in a little fat.